I met Tom in high school. We worked afterschool at Lucky's market as box boys. We also played baseball together and went to the YMCA. When we were finishing school at Lakewood High School, Tom decided to join the army. We wanted to go in together on the buddy system, but at that time, my mother wanted me to finish high school before joining. We kept in touch through the mail while he was in the military. The way that I found out that my friend had been killed was when I was looking through an issue of LIFE Magazine, the May 1969 issue, and I was looking through the listing of military personnel who had been killed and that's when I saw his name and photo. The same photo that is shown here. 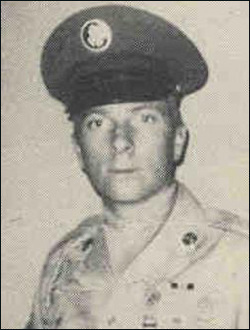 Tom Barth was killed when enemy elements attacked his night ambush location with grenades and small arms fire. Killed with Tom Barth was Tim Robson. A third man was wounded and another man suffered severe shock. A patrol was sent out to reinforce the team....but found that the enemy had withdrawn. Tom was a funny guy and had a great sense of humor. He was an all round great guy. Tom was laid to rest at Forest Lawn, Cypress. Thomas was born and raised in Lakewood and attended schools in Lakewood: Bancroft and Lakewood High School. We used to hang around the Lakewood Canteen (Lakewood Youth Center) and Lakewood Center.